Obama cries as he describes the toll of gun violence in the country on Jan. 5. 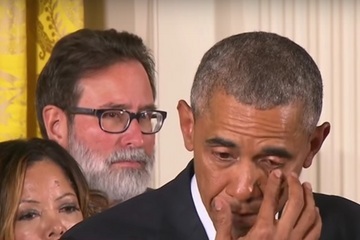 In his call on Tuesday for stricter gun-control measures, President Barack Obama wiped away tears as he mentioned the December 2012 massacre of innocent children at Sandy Hook Elementary School. Many news stories on the president’s speech noted his tears prominently in the headline or the first few lines of the article highlighting that it’s still unusual to see a man crying publicly. But just what is the science behind male tears? It turns out that although men do cry. Still, while male tears are less common and less intense, men weep at the same types of emotional triggers as women do, research suggests. What’s more, Obama’s ability to shed a few tears may even make viewers feel emotionally close to him, other research suggests. It’s a well-worn stereotype: Women well up at sad news, weepy movies and even the odd diaper commercial, whereas men remain dry-eyed in the most harrowing and heartbreaking situations. But it turns out that the stereotype may actually have some grounding in fact. Women cry dozens of times a year, on average — up to five times more often than men do, on average, according to research reported by psychologists Ivan Nyklicek, Lydia Temoshok and Ad Vingerhoets, all of Tilburg University in the Netherlands, in their book “Emotional Expression and Health” (Routledge, 2004). The weepier nature of women shows up in cultures around the world. However, in some poorer countries such as Ghana, Nepal and Nigeria people cry less overall, and men cry only slightly less than women, according to a 2011 study in the journal Cross-Cultural Research. That could be because poorer cultures dissuade emotional expression, while people in richer countries such as the United States sob more because the culture encourages it, the researchers hypothesized. The river of tears dividing men and women may have a biological basis. Women’s higher levels of the hormone prolactin (which is involved in breast-feeding) may spur them to tears, whereas men’s higher testosterone levels may inhibit tears, one theory holds. In fact, one 1998 study in the journal Cornea found that premenopausal women with lower levels of prolactin and higher testosterone levels shed fewer tears than women with high prolactin and low testosterone. And until puberty, with its hormonal onslaught that affects boys and girls very differently, both sexes cry about equally, according to a 2002 study in the British Journal of Developmental Psychology. Men’s more stoic demeanor may be about simple geometry. Women have shallower, shorter tear ducts that are more easily overtopped, leading to more visible tears, according to a paper published in the 1960s in the American Journal of Physical Anthropology. Some researchers have argued that the gender difference in tears is at least partly cultural. Stories from long-ago cultures — including those in the Bible, “The Iliad” and the medieval knights’ tales — are replete with sobbing, powerful, manly men. The discrepancy in male tears versus female tears may be a more recent phenomenon that began when men went to work in factories, according to the book “Crying: A Natural and Cultural History of Tears” (W. W. Norton & Co., 2001). Hard-charging bosses may have dissuaded emotional displays in order to increase productivity, and although some women went to work too, they were more likely than men to stay in the home, where tears were not so openly discouraged. However, the triggers of tears in men were similar to those in women in the study: The death of a loved one had caused 74 percent of the surveyed men to cry, while tearjerker movies, breakups and even happy moments in films or movies spurred waterworks among the men in the Kleenex study, according to the findings. But regardless of whether men cry more than women, Obama’s tears may have made people feel closer to him, according to a theory that holds that people cry to signal vulnerability. Tears blur a person’s vision, making them less powerful as aggressors, the theory goes. That, in turn, could form a powerful signal to a potential competitor that you are not a threat, potentially eliciting mercy and sympathy, Live Science previously reported. If two people both reveal that their defenses are lowered, that may spur bonding, the theory says.